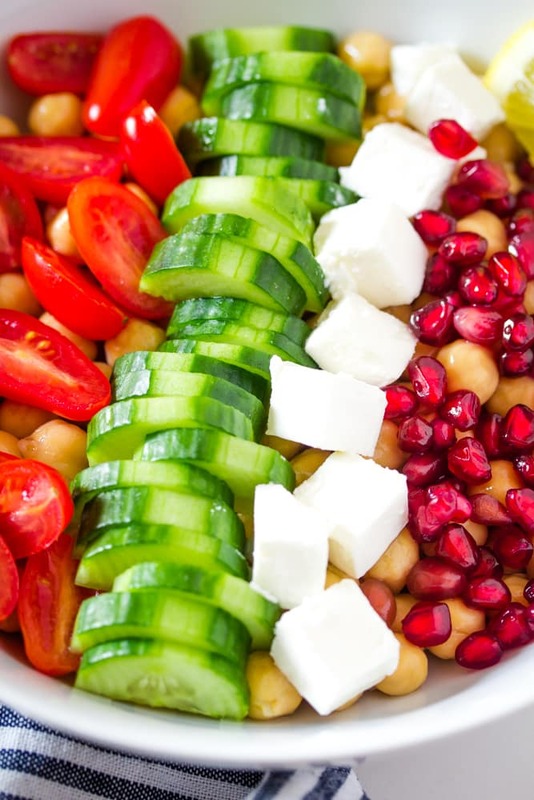 This Garbanzo Bean Salad is a fresh and bursting with flavours salad. It’s perfect for long summer days, when you don’t want to be in the kitchen for too long. It’s super quick, easy and delicious and also perfect for potlucks. 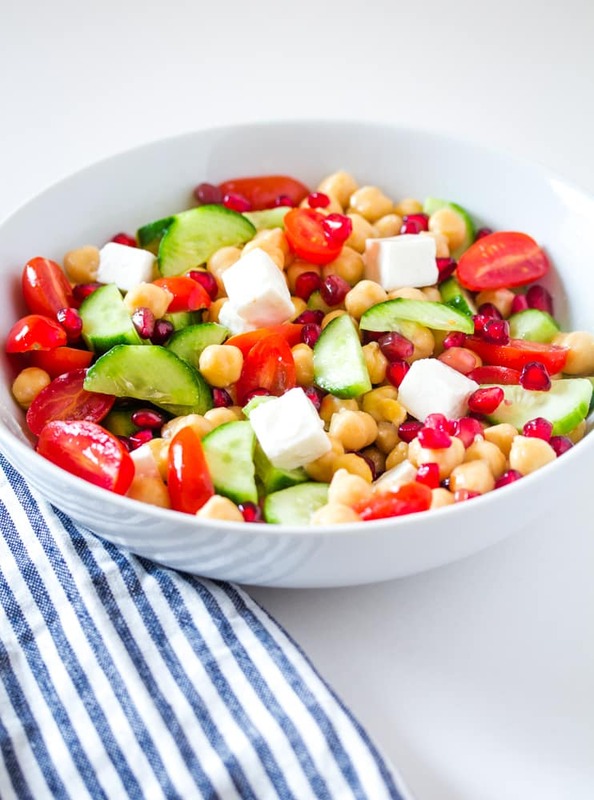 I often like making different variations of salads using up garbanzo beans (chickpeas) because I always happen to have canned ones in my pantry. This Chana Chaat recipe on my blog is pretty popular, so I though why not share another favourite version of summer salad using my favourite garbanzo beans? Btw did you know that garbanzo beans and chickpeas are the same thing? I like saying garbanzo, because it sounds more interesting and sophisticated. Lol. 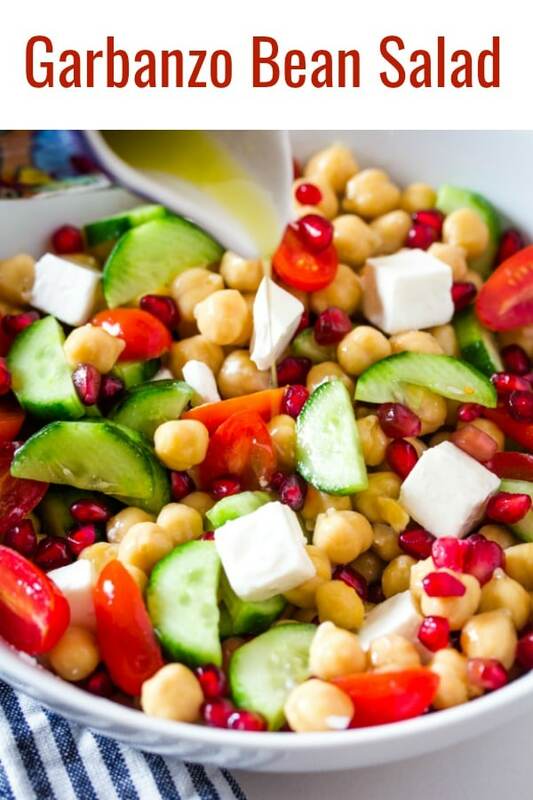 This summer garbanzo bean salad is bursting with fresh flavours….with pomegranate and feta cheese being my favourite. 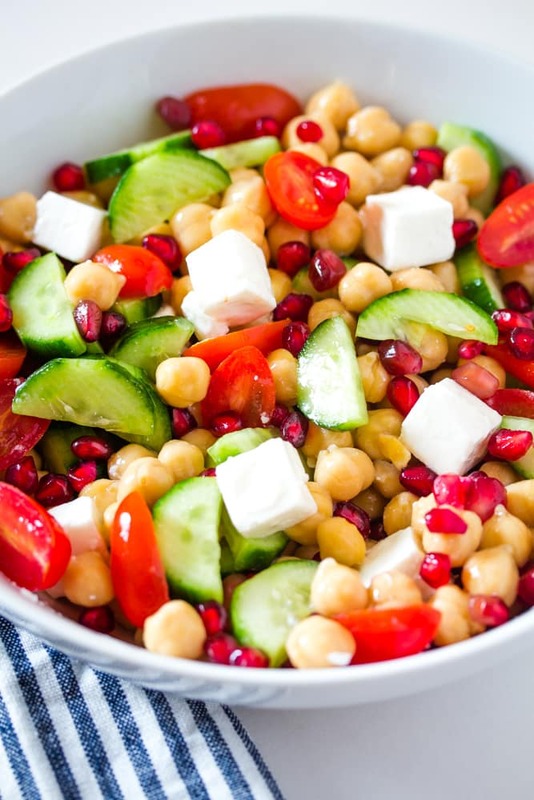 I just love how beautiful the pomegranate seeds look in this salad, and the tart sweetness contrasts so well with the salty creaminess of the feta cheese. Feta cheese has to be my favorite type of cheese, just btw. I also add cucumbers and cherry tomatoes for their fresh flavours and different textures. 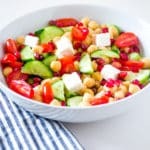 This Garbanzo Bean Salad is so versatile, you can change up the ingredients if desired…I think olives would be a lovely addition in this salad. Sweet red or yellow bell pepper would be a great addition to this salad as well. I love this chickpea salad SO much that I actually skipped dinner the other night to just have this scrumptious garbanzo bean salad. The reason why I love using chickpeas or garbanzo beans in salads is because then the salad is actually filling enough (and healthy!) and can be consumed as a meal, as opposed to being just a side dish. Now that we’ve covered the Garbanzo Bean Salad basics, let’s talk about this greek lemon dressing. I’ve kept it very simple, as I always do with my salad dressings. 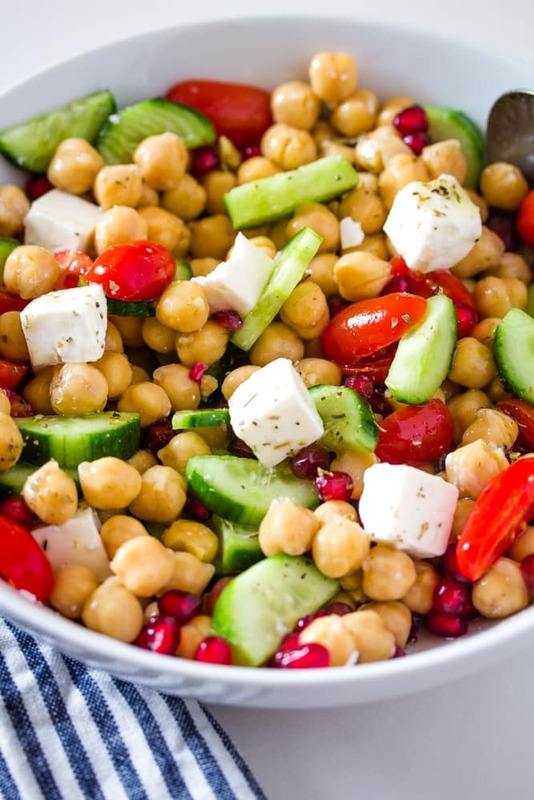 For a delicious and fresh dressing that’s perfect with this Garbanzo Bean Salad. 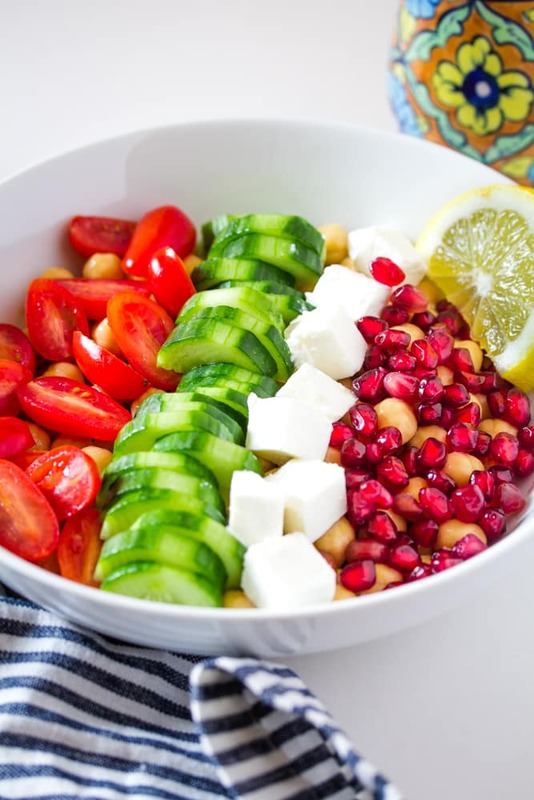 I do hope you make this gorgeous summer salad and enjoy it! 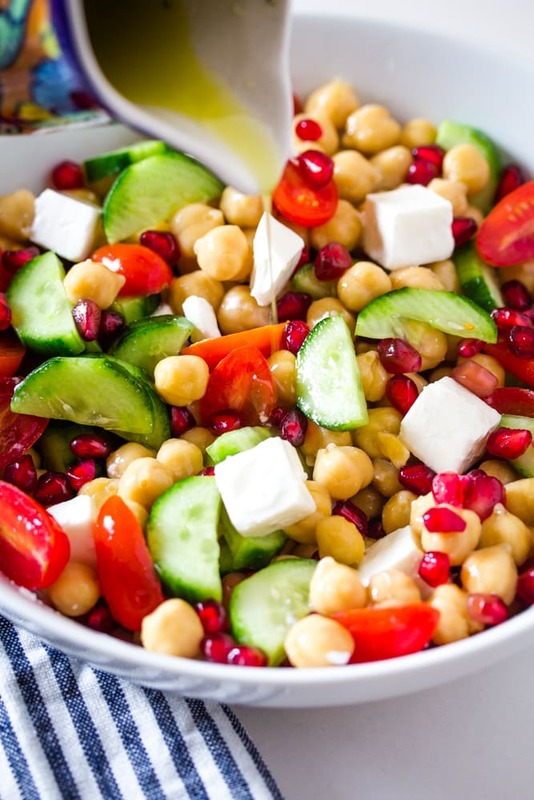 Looking for more Delicious Salads? In a mason jar or a small bowl, whisk together all of the dressing ingredients until combined. Pour over dressing and toss the salad, before serving. Salad keeps well in the fridge for up to two days.